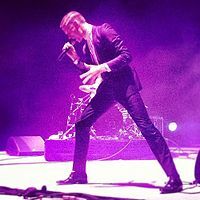 William George Sinclair (born 2 June 1989), better known by his stage name Willy Moon, is a New Zealand-born musician, singer, songwriter and producer. He is known for his 2012 single "Yeah Yeah" which appeared on the 2012 Apple iPod advert and peaked at number 26 on the UK Singles Chart. In March 2015, Moon and his wife, Natalia Kills, were fired as judges from New Zealand X Factor for their comments and behaviour towards one of the contestants. Moon was born in Wellington, New Zealand. He left school when he was 16 and left New Zealand when he was 18. He spent time in Berlin before moving to London, United Kingdom. Since 2014, Moon has been living in New York City, United States. In May 2014, Moon married singer Natalia Kills in New York City. In 2010, Moon released his first song "I Wanna Be Your Man" on Myspace, where he was first noticed and subsequently acquired a record deal with Island Records. He released his first two singles through Luv Luv Luv Records. He received buzz for his off the wall approach to production, being named as a "One to Watch" by The Guardian and one of the "Faces of 2012" by Q magazine. He has also been featured in GQs "Most Stylish Men", one of Elle's "Bright Young Things" and profiled by Vogue. His music is described as "a brilliantly odd fusion of 50s rock'n'roll and modern production" using "hip-hop production techniques". Moon's single "Yeah Yeah" was playlisted on BBC Radio 1 in early 2012. He and his band also performed live in session for Huw Stephens for BBC Radio 1 at Maida Vale Studios in May 2012. He also performed on the television show Later... with Jools Holland for the BBC in October 2012. In July 2012, Moon released the singles "Railroad Track" and "Bang Bang" through Jack White's label Third Man Records. Moon's song "Yeah Yeah" was used in Apple Inc's 2012 iPod lineup TV advertisement, including the 5th-generation Touch, 7th-generation Nano, and 4th-generation Shuffle. "Yeah Yeah" was also featured on the Sosh Orange 2012 advertisement that ran in France and as part of the Forza Horizon video game soundtrack. At part of his 2012/2013 US tour, Moon performed on the television show The Tonight Show with Jay Leno for NBC. In April 2013, Moon released his debut album, Here's Willy Moon. The album featured "Yeah Yeah", "Railroad Track" and "I Wanna Be Your Man". In August 2013, Rockstar Games included "Railroad Track" in the Grand Theft Auto V soundtrack list. Ubisoft also launched a new Assassin's Creed Black Flag trailer featuring "Railroad Track". His tracks continue to be utilised in advertising, "Working for the Company" was used in the "Mr. Selfridge" advert in early 2014, "Yeah Yeah" features in a global Nissan Altima commercial and his cover of "Shakin" was the backing track to the Q1 Sky Atlantic UK television commercial. In 2015, Moon was a judge and mentor on the X Factor New Zealand alongside wife, Natalia Kills. Both Moon and Kills were fired following the first live screening for bullying and humiliating a contestant. Moon compared the contestant to Norman Bates, and Kills accused him of copying Moon's look. The comments led to widespread condemnation on social media, including a petition to have Kills fired from the show, which reportedly received over 70,000 votes within 24 hours. The show's sponsors, franchise owner and fellow judges also voiced public disapproval of the incident. ^ "Songwriter/Composer: SINCLAIR WILLIAM GEORGE". Repertoire.bmi.com. Retrieved 20 May 2013. ^ Lester, Paul (11 July 2011). "New Band of the Day – Willy Moon (No 1,059)". London: The Guardian. Retrieved 19 April 2012. ^ Monks, Steph (14 May 2015). "Natalia Kills and NZ's very own Willy Moon are married!". New Zealand Herald. Retrieved 15 March 2015. ^ Smyth, David. "He's got the looks and Willy Moon is set to conquer the charts". The Evening Standard. ^ Kappala-Ramsamy, Gemma (27 November 2011). "One to watch: Willy Moon". The Guardian. London. Retrieved 19 April 2012. ^ Catchpole, Chris. "New To Q With Chris Catchpole – The Faces of 2012: Willy Moon". Retrieved 19 April 2012. ^ "Willy Moon – Image 10 of 10 – Most stylish men of the week – GQ.COM (UK)". Gq-magazine.co.uk. Retrieved 20 May 2013. ^ "Here's Willy Moon | Buy The Debut Album Now". Willymoon.com. Retrieved 20 May 2013. ^ "Willy Moon Musician Profile Interview (Vogue.com UK)". Vogue.co.uk. 16 May 2012. Retrieved 20 May 2013. ^ Cragg, Michael (10 December 2011). "This Weeks New Singles". London: The Guardian. Retrieved 19 April 2012. ^ Kappala-Ramsamy, Gemma (27 November 2011). "One to watch: Willy Moon". London: The Guardian. Retrieved 19 April 2012. ^ "BBC – BBC Radio 1 Programmes – Huw Stephens, Willy Moon in session, Honest Jon's Label of Love, Willy Moon – I Wanna Be Your Man in session". BBC. Retrieved 1 June 2012. ^ Mir, Jorge (17 October 2012). "Video: Willy Moon – Yeah Yeah (Live On Jools Holland)". Listen Before You Buy. Retrieved 20 October 2012. ^ Swank, Ben. "WILLY MOON AND THIRD MAN RECORDS ANNOUNCE NEW SINGLE". Retrieved 30 July 2012. ^ Rebecca Armstrong (14 September 2012). "Music: Willy get a boost from Apple? – News – Music". London: The Independent. Retrieved 20 May 2013. ^ "Sosh – Vibrez sans engagement". YouTube. 22 August 2012. Retrieved 20 May 2013. ^ "The Tonight Show with Jay Leno". NBC. 12 December 2012. Retrieved 16 March 2013. ^ "Willy Moon reveals debut album release plans | News". Nme.Com. 18 February 2013. Retrieved 20 May 2013. ^ "X Factor judges Natalia Kills, Willy Moon sacked". Stuff.co.nz. Retrieved 17 March 2015. ^ "Pressure on TV3 after X Factor judges Willy Moon and Natalia Kills humiliate contestant on live TV". New Zealand Herald. 16 March 2015. Retrieved 16 March 2015. ^ Beswick, Angela (16 March 2015). "Natalia Kills, Willy Moon fired from X Factor NZ". TV3. Retrieved 16 March 2015. ^ a b Hung, Steffen. "Discography Willy Moon". New Zealand Charts Portal. Hung Medien (Steffen Hung). ^ Hung, Steffen. "Discografie Willy Moon". Belgium (Flanders) Charts Portal. Hung Medien (Steffen Hung). ^ Hung, Steffen. "Discographie Willy Moon". Belgium (Wallonia) Charts Portal. Hung Medien (Steffen Hung). ^ a b Hung, Steffen. "Discographie Willy Moon". French Charts Portal. Hung Medien (Steffen Hung). ^ a b "Willy Moon > UK Charts". Officialcharts.com/ Official Charts Company. ^ Lipshutz, Jason. "Natalia Kills, Willy Moon & The Madness of Their 'X Factor' New Zealand Rant". billboard.com. Billboard magazine. Retrieved 17 March 2015. ^ Hung, Steffen. "Discographie Willy Moon". German Charts Portal. Hung Medien (Steffen Hung).